I'm currently working on the upper strategic layers of Arduxim Squadron Command. 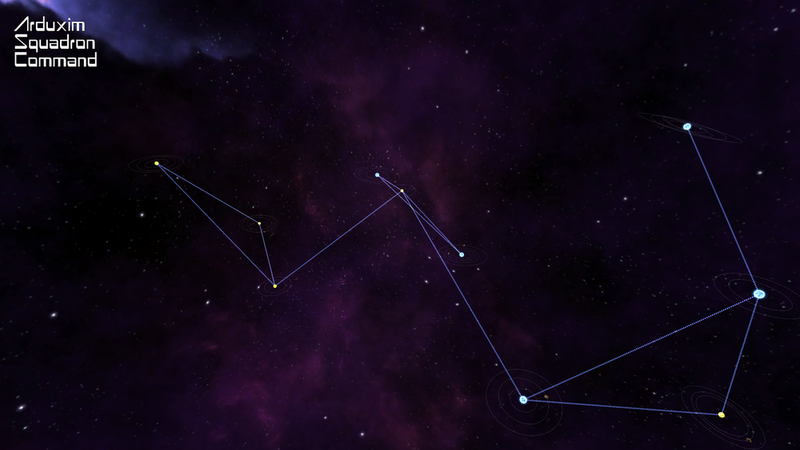 At the very top level the player is presented with a view of the galaxy with several 'sector maps' available. A sector map is a collection of somewhere between 5 and 20 stars which are linked by hyper gates. It is campaigns in these sectors that form the backbone of the strategy layer. My current thought is that each sector campaign will have a specific goal such as finding and destroying a hidden pirate base, reaching a distant research based and escorting the scientists back from it, and so on. Each star has its own collection of planets, asteroid fields and other points of interest. A campaign begins with the fleet arriving in a planetary system within the sector. 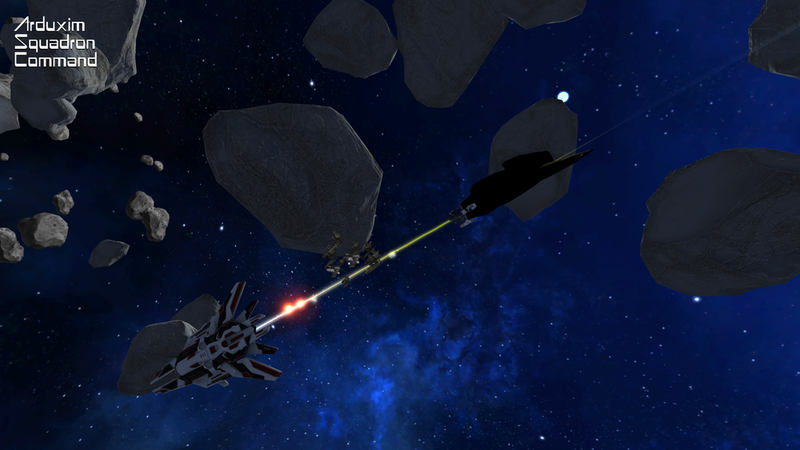 The player then moves their fleet through each system, performing missions and using the hyper gates to jump to connected systems. Missions will play out in the 'tacscape' where the player controls individual fighters in pausable real time. The scope within the game goes from galaxy to sector to system to planet, and in VR being able to see this has extra impact. I haven't yet decided how the galaxy layer will link the sector/campaign gameplay. Here are a few options I'm considering. Please let me know what you think. 1. A rogue-lite where each sector campaign is one run, with some persistence between campaigns. Probably not the entire fleet, maybe just the commander (who would level up if he survives) and/or unlocked technology. 2. A more traditional strategy game design where the player retains the same commander, fleet, etc between sector campaigns and the galaxy forms the overall campaign. With either of these there needs to be an overarching plot to tie the campaigns together and be the overall win condition of the game. The obvious one is an enemy faction that the player faction is at war with, and you need a powerful enough fleet to take on the final campaign to destroy their command structure. However it may be difficult to indicate to the player when they are strong enough. An alternative would be something similar to Heat Signature's design, with each sector campaign being a different commander who has a specific objective (which forms the goal of the campaign) and the galaxy-level objective remains mostly in the background. The galaxy level play could be left open ended but I feel a specific goal will give the player more reason to keep building their fleet.commander/experience. This is still in flux and will need to be determined regardless of whether the strategy layer plays as a rogue-lite or not. I've spent my recent development time improving the animated gif creation tools for Arduxim Squadron Command. I've added a 'circle gif' which gives a very nice visualisation of the 3D space of the game. Here is a circle gif of the galaxy view, where the player will choose the next campaign to undertake. I've also added the game's logo to the gifs and still images. This was far more complicated than I expected, I think due to the way I take the gifs and images. They do not just snapshot the display shown to the player, instead they rerender the frame at a custom resolution (640x480 for gifs, 2650x1440 for stills). Positioning the logo on the Unity canvas so it appears in the right place and size simply didn't work using the obvious setup as the canvas was sized to the real (VR) display. Eventually I got it to work by creating a canvas for the resolutions I wanted and rendering these explicitly over the gif or still image. The end result is a sharply rendered logo which appears exactly how I want it. In case anyone is wondering, there is an actual game being developed here. It's just that I didn't market Starfighter Arduxim until near launch and want to do better with Arduxim Squadron Command. I'm working towards a vertical slice which will allow myself and play testers to get a feel for the overall game structure If you're interested in play testing subscribe to the mailing list here to be notified when one becomes available. Currently I have a fair amount working in the tactical layer where combat occurs, as this part reuses a lot of the Starfighter Arduxim code. I'm working from the main menu, through the galaxy view, the campaign view, then to possible a solar system view to finally link to individual combat areas in the tactical layer. The tactical battles in Arduxim Squadron Command will be linked by a strategy layer where you move your fleet between systems. At the moment I'm planning for a campaign to take place in one sector of space where all the star systems are connected through hyper gates (these gates were seen in several missions in Starfighter Arduxim). One play-through will either consist of a single large sector, or several smaller sectors where the player can choose the next sector to tackle. This second design makes the game more rogue-like (possibly more correctly rogue-lite) and I'm not sure if I want it to be like that, but it's something that can be narrowed down as development progresses. The way it works is as follows. I use the terms node and edge as this algorithm is really generating a graph (and so it may be used for other structures than the sector map). Start with a cuboid with integer dimensions (say 4x3x10). Choose some random nodes from the possible points within the cuboid. By limiting the points to integer coordinates it avoids a common problem with random generation where several nodes bunch up or overlap. To avoid the integer grid being too obvious, move each node by a small random direction and magnitude (controlled by Position Variation in the editor). If this is less than 0.5 then the nodes can't overlap. Create edges in the graph to join each node to its nearest neighbour. This ensures it's possible to get to every node in the map and makes 'sensible' connections in terms of being a sector map, as systems would likely have links to nearby systems instead of distant ones. To make the graph/map more interesting add some additional edges. This makes some systems more valuable than others in terms of accessing more of the map. This gives surprisingly good results for how simple it is. There are a couple of bugs - I haven't seen it yet but there is no checking of whether an edge between two nodes passes through a third node, which wouldn't make sense in the context of the game. If you've any comments please leave them below. I've uploaded a short vlog showing the current state of the controls and combat.